look who I found asleep in one of my gardens. Oh my lord Philip, what did you do ? Just let it sleep, and leave on it's own, or did you take a few shots from a safe distance, and then send it on it's way ! They are beautiful creatures, that are becoming scarce here in the States, but I would be afraid for my cat . No I let her sleep worked on a garden next door. Came back this morning and there she was asleep under a tree, but she woke saw me and she was off . got a couple of shots of her but not so close this time, I will post them. He must have known this garden was meant for relaxing lol! Awwww, so cute while sleeping. She looks so beautiful fast alseep on your lawn. She certainly wouldn't come into my garden, not with all my rabble dogs. It is a quiet garden. This is a wonderful photograph. We used to get a dog fox on our land when we had the smallholding and he used to walk right past you without a care. Foxes are beautiful to look at but very sly at times. One got my chickens one night and so we buried them. He came and dug them up one at a time and took them. I still admire the fox and he has to eat to survive. Nature can be harsh at times. Thankyou Pollyannaever, I am very lucky, we have a very healthy wildlife population in the area that i work, I never know from day to day what I am going to see. Beautiful how lucky you are is she a frequent visitor. We just have a squirrel with a death wish either that or shes fallen out of one too many trees bless. I normaly catch sight of her a couple of times a month, not normaly so close. I did find her asleep before in a garden, in fact I nearly tripped over her, she was laying inches from my feet as i walked around a border. I froze. standing silently holding my breath lest I wake her, It felt like time stood still, for at least 30 seconds anyway, then she opend her eyes and i swear if she could have rubbed her eyes in disbelief she would have, after a few seconds she realised it wasn't a dream and was up and away. That was a special day for me. Not sure about getting up close with bears, wolves on the other hand, this is a wish yet to be fulfilled to get close to one would be great. 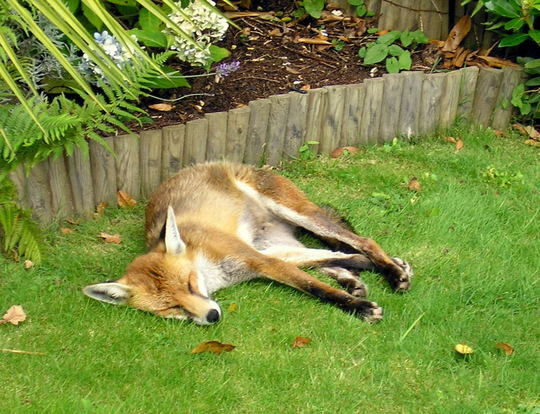 You did well to take this photo without waking the fox. I was indeed very lucky. It's always wonderful to see anything to do with animals that is as lovely as this. We see to many things that make you feel sad and all animals are wonderful. Thankyou Homely I agree, I would rather photograph animals than people any day. That's lovely! I've never seen such a chilled out fox before. All the foxes around here are terrified. Wonderful. We saw a fox in a cemetary in London, near Chelsea, last year, and I was chuffed! FlCrazy, Foxes and Cats have a mutual respect for each other and stay out of each others way. They seem to both know that they are predators. Anyway, the last thing a Fox wants is its face ripped to shreds by the claws of a cat! Complete myth about Foxes killing Cats.